World Population Day is observed to bring awareness about issues related to huge population growth around the world. 29th World Population Day will be observed on July 11, 2019. World Population Day is celebrated at International level to spread knowledge about Population issues around the globe. In 2018, the day was celebrated with theme: 'Family Planning is a Human Right'. World Population Day as the name suggests is an annual day observed around the world to bring awareness about Population growth and its related issues. With a population of more than 7.5 billion as of March 2017, it's very important for people on earth to realize and act on healthier lives and importance of small families. Started in 1987, World Population Day has gained much popularity with support from organizations and masses around the world. It also focuses on challenges presented by world of 7 billion people. Reproductive Health services are one of the main targets set by UNFPA (United Nations Population Fund) by 2015. So World Population Day is observed in more than 200 countries to bring awareness to people about importance of small families and living healthy lives. On this day, several programs are initiated to educate people about family planning methods. The day is observed every year to bring awareness in people about living a healthy life with benefits of having a small family. World Population Day was first started on 11 July in 1987, the day world population reached five billion people. Many organizations around the world celebrate this day by arranging special campaigns and programs to educated people about global population issues. They are working closely with Government Organizations, NGO's and numerous non-profit organizations to spread the message. 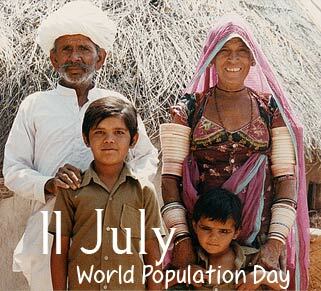 On 11 July, 2007, the 20 anniversary of World Population Day, the estimated World Population was 6,727,551,263. World Population Day or Five Billion Day is observed throughout the world in more than 200 countries. World Population Day 2019 will be observed on Wednesday, 11 July. World Population Day 2016 theme was 'Investing in teenage girls'.